Wanting to increase the number of orthopedic surgery and treatment volumes for sports related injuries, IVCH asked McD to develop a new Sports Medicine Campaign that emphasized the prevention, evaluation, diagnosis and surgical solutions of Dr. Meier, Dr. Mitchell and Dr. Murphy. Key targets for the campaign included parents of child and teenage athletes as well as adult athletes suffering from pain due to injury. Services were also promoted to one collegiate athletic program, three high school programs, two grade school programs and one youth football league were also targeted. Realizing one of the best ways to market sports medicine is to establish the fact that you care about preventing injuries in the first place, McD aimed to educate the public about common sports injuries and how IVCH can help with prevention as well as treatment. The campaign targeted specific athletes (runners, volleyball players, basketball players and football players) and highlighted some of the most common sports injuries. The key message communicated in all was IVCH helps with the training and recovery for hips, knees, feet and ankles to help prevent ACL and MCL injuries, labral tears, concussions and stress fractures. Print ads, social media campaigns, a radio spot, Facebook Newsfeed ads, YouTube videos, and website content were all developed targeting those interested in football, basketball, volleyball, cross country and track. 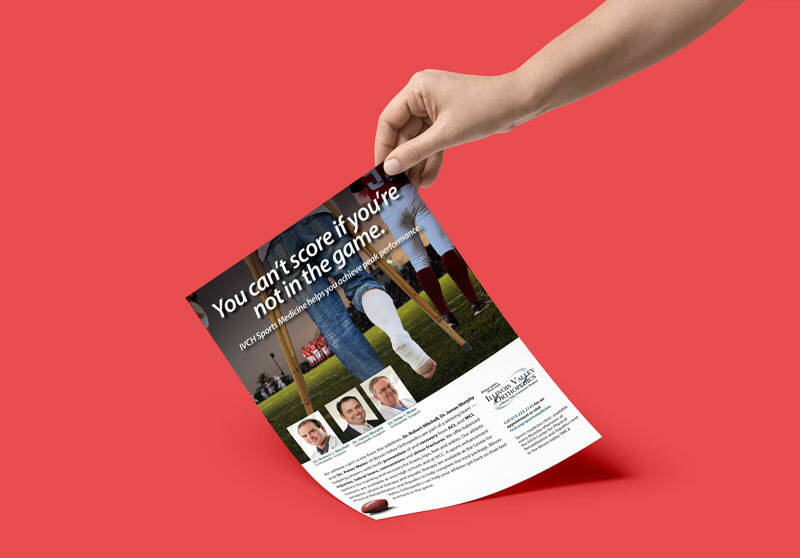 Ads for this campaign rotated based upon the sport season. To create a strong emotional appeal, McD focused ad creative on a sidelined athlete and how they have to watch as the action continues and centered around the idea “You can’t score if you’re not in the game” with the implication that IVCH can help athletes get back on their feet once more. Two videos were also developed that created even more buzz about the campaign and IVCH sports medicine services. In just six months the videos had been view over 40,000 times with more than 20% of viewer watching the entire video. Social engagement for the IVCH sports medicine campaign is proof that our targeted methods work. Within eight months the ads had been seen by over 400,000 people that had a direct interest in sports. Of that 7,094 clicked on the ad and 6,183 people continued to the journey to end at the IVCH sport medicine landing page. Page likes for the IVCH Facebook page also increase during this time and engagement with posts garnered many reactions and shares. Overall, the campaign has helped boost the brand for all physicians at Illinois Valley Orthopedics. Recently, they had 106 new orthopedic patients.